You go about your day just like every day. Maybe you are at work, or shopping, or just at home. Just going about your business as usual. But this day, this is no normal day. Nothing about it is normal. Your life can change in an instant at the hands of evil. They could be evil-minded or possibly mentally deranged. Either way, to start a fire and cause death and destruction is plain evil! I cannot imagine what all the evacuees in San Diego, CA during this time are going through. What were they thinking when told to get out of their homes and run to safety? What could they possibly have taken with them in such short notice besides two and four-legged family members? Where did they all go? How do they manage the unknown—is their home safe, are our neighbors safe? No, I cannot imagine. I only know my son and his family of two and four-legged members are one of thousands. The picture above is from his backyard. So close. Too close for comfort. Shortly after he shared this picture with me they were evacuated. 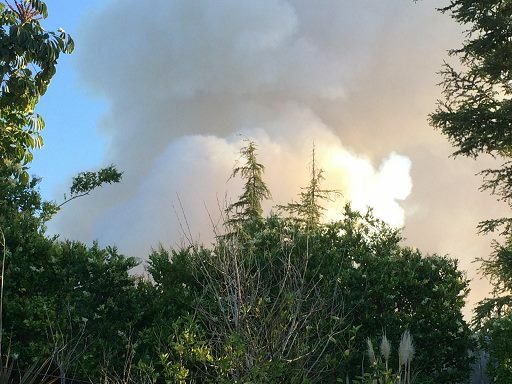 The fire named The Cocos fire was spreading due to the Santa Ana winds. And still as of today, it is only 5% contained. His little family is safe and sheltered at a family member’s home. Thank God! So, yes as we go about our business of daily routines we take for granted each and every day, this, my friends will put it in perspective. You never know what one incident can do to affect and rock your whole world. Now your day is an emotional roller coaster of survival, the unknown and yes even thankfulness for being safe. Stand with me in prayer for all these communities affected. Thank you and God Bless you all.